It's kinda been a New Year's resolution of mine, to display pictures more around my home. I feel like I take all these great pictures of my kids and RARELY print them out, and display them! I just sprayed my large unfinished clothes pin, with white spray paint. I put mine here, on my entry way table. I like the height it gives too! 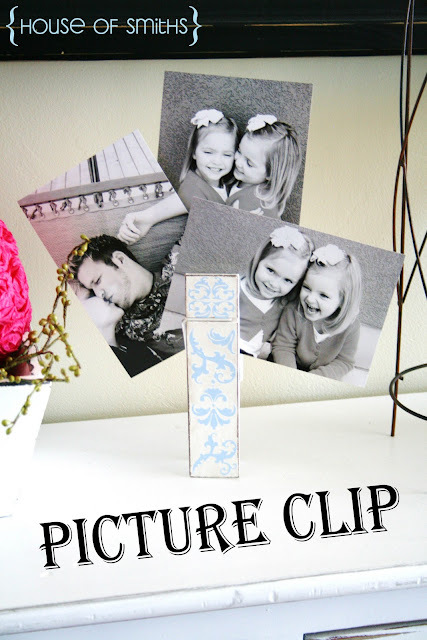 I've seen people stamp or use paper, on the front of their clips, for decoration too! Let your imagination run wild, ladies! How cute is that?! I feel the same way!!! Love love love! I always wondered what the heck people did with those big clips! I love that... I think the same thing about frames its just a shame most hold only one..the clip idea is genius. Your cute ideas just keep coming! :) Thx for stopping by my blog! That's like having a celebrity in your home! I have really loved reading your blog & seeing all of your projects. I wish I had time and means to do them ALL! Thanks for all the cute ideas & SOOO appreciate your tutorials! I love that! I think you are so right about displaying pics. I never print them off. I don't have the space for all the frames so this is a perfect solution. Love it. Hey, that would make a nice gift! I like it! Thanks for playing Toot Your Horn Tuesday! I always wondered what in the world people would do with such a large clip...I LOVE IT! It's on my Hobby Lobby list now....so cute! Thanks for linking up to Ta-dah Tuesday! where did u get the big clip? I can't find them! soooo adorable! These are so pretty! I absolutely love your blog. HOW MUCH???? lol.... I love love your blog girlie! So much fun and creativity! I have a large blue acrylic plastic one... I am sitting here going Hmmm??? There you go again, thinking up another cute thing! Is that blue color the color in your kitchen? I love it! That is so cute! I love that distress ink. Adorable! I just love popping by your blog and seeing what new creative idea you've posted! ha ha! was totally looking at making some of these yesterday! Love how it adds a great personal touch in the entryway. It would be cute to put the stain tips clipped in this. Maybe laminated or something. so sweet! we're crushin' on your modern take of shabby chic. Thats is toooo cute! Where do you find those big clips?? LOVE LOVE IT!!! You are soooo creative!